The close of another year gives us an opportunity to pause and reflect on the newsmakers we bid farewell to in 2014. But this year, rather than reflect on icons we lost, this waterman would like to tip his lucky fishing cap to the bodies of water we've lost -- or are in danger of losing -- here in California as the drought was clearly the dominant story of 2014. Even with late-December storms that were the strongest in five years, 2014 was one of the driest years on record for California, with one study suggesting it’s the worst in 1,200 years. To make matters worse, new analysis from satellite data suggests the Golden State needs another 11 trillion gallons of water (or one and a half times the capacity of a full Lake Meade) to recover from this three-year drought. According to the University of Nebraska Drought Monitor, most of California -- with the exception of the far northwest and southeastern corners -- is still in the red, or "extreme" or "exceptional drought." In the harder hit regions, many small lakes, creeks and ponds have already dried up. In my hometown of Atascadero, for example, the small lake at the center of many community events completely disappeared in the fall. Atascadero Lake can only hold 68 million gallons over less than 30 acres, but that water is not used for residential, environmental or agricultural purposes, meaning it's entirely at the mercy of Mother Nature and this epochal drought. Atascadero Lake photos by Brian Milne. In nearby Monterey County, a much larger reservoir, 350,000-acre-foot capacity Lake San Antonio, was down to just 4 percent of capacity, according to the Monterey County Water Resources Agency. That's the popular bass fishery's lowest mark since the reservoir was constructed back in 1967. Other Central California lakes that were at single-digit capacity this month include: Eastman Lake (8 percent), Hensley Lake (6 percent), Lake Isabella (8 percent), Lake Success (5 percent) and McClure Reservoir (7 percent). But what about the state’s major reservoirs? For the most part, California’s primary reservoirs are well under 40 percent capacity, with the largest, Shasta Lake in Northern California, sitting in the best shape at 40 percent as of Dec. 27, according to the California Department of Water Resources. Lake Oroville, Trinity Lake and Millerton Lake are down to about a third of capacity, while Pine Flat Reservoir is down to 13 percent, New Melones down to 23 percent and Exchequer Reservoir down to 7 percent. According to the DWR, "Surface reservoirs are unlikely to be recharged to normal levels unless precipitation and snow pack this Water Year are both well above historical averages." The good news? California finally received some snow in recent weeks, as the Sierra Nevada mountains are still snowcapped above California's parched Central Valley. 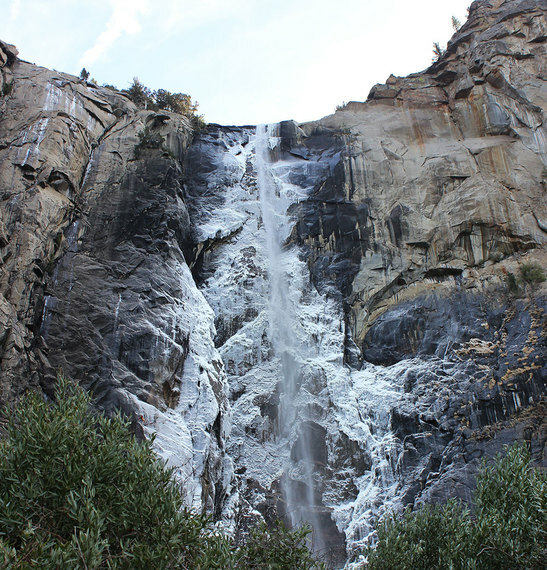 On a trip to Yosemite National Park on Dec. 27, we were thrilled to find the waterfalls were flowing this month for the first time since June, when iconic cascades such as Yosemite Falls had gone dry during the height of the drought. Bridalveil Fall photo by Brian Milne. 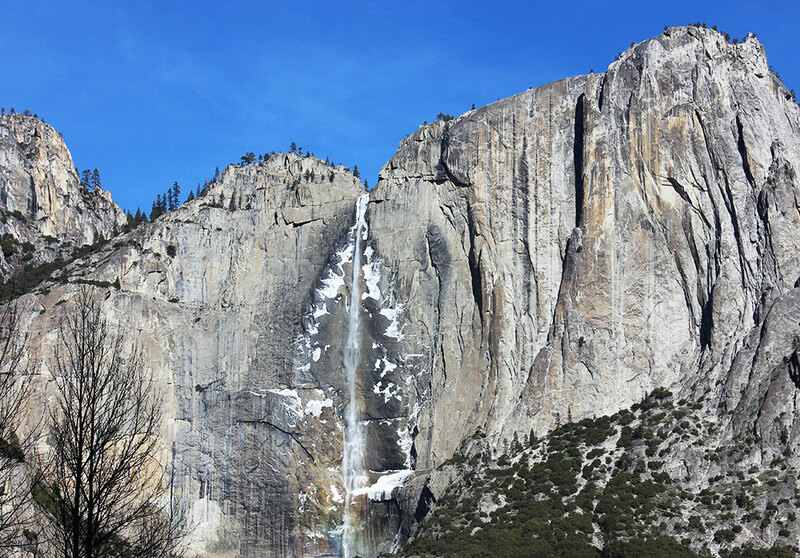 Yosemite Falls photo by Brian Milne. We'll learn more about the state's snow levels when the DWR releases its first snow survey by year's end, but it's clear California is going to need storm after storm from now until March to make a real dent in this drought. In the meantime, federal, state and regional water officials stress water conservation is still as important in 2015 as it was in 2014. In a memo to stakeholders on Dec. 12 announcing a draft Interagency Drought Strategy for 2015, directors from DWR and other water agencies noted, "We must prepare for the worst and assume that dry conditions will continue, and so we are planning to manage the Central Valley Project and State Water Project through a fourth year of drought." Here's hoping the 2015 year-end story isn't as dry as this one.